1. When I turned 20, the times were simpler, slower…and boooring! Today, 21 is my ticket to a new and exciting world. It’s time to celebrate. Happy 21st birthday to me. 2. Now that I’m 21, I’ve got plenty of catching up to do in the drinking department. Happy 21st birthday to me. 3. Congratulations to me on turning 21. Now I’m old enough to pay for my own drinks. 4. May my 21st birthday be even more wonderful than I ever expected. If there’s anyone who deserves a truly special day, it’s someone as special as me. 5. Although I’m 21 now, I still can’t wait to blow out my candles, eat my birthday cake and open my gifts. It looks like I already have my priorities straight. 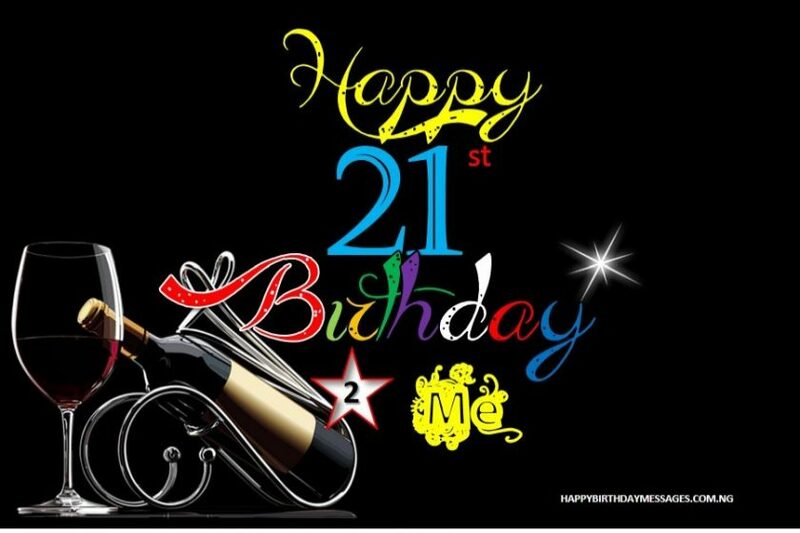 Lol… Happy 21st birthday to me. 6. When I was a kid, I couldn’t wait to grow up, be an adult and do whatever I wanted. Today, I’m 21, and all grown up, an adult and able to do whatever I want. 7. At my age, I have the rest of my amazing life right in the palm of my hands…along with a stiff drink and a one-arm bandit slot machine. Happy birthday to me at 21. 8. May I live long, prosper early, laugh heartily and love deeply. Happy 21st birthday to me! 9. At 21, I have the legal right to drink, gamble, rent a car and get my parents to pay for it all. Happy 21st birthday to me. 10. At 21, a whole new era, filled with adventures, mishaps and life lessons, is about to start. I’m entering this age with my eyes and heart open. Happy 21st birthday to me. 11. My life is just about to pick up speed and blast off into the stratosphere. I’m gonna wear a seat belt and I’m sure to enjoy the journey. Happy 21st birthday to me! 12. Wow, I’m 21 already. I can do so much now. But I’m gonna take a step at a time. I’ll spread it out, cos I have many years and hangovers ahead of me. It’s my 21st birthday. 13. I’m enjoying this champagne because I am now able to drink legally! Happy 21st birthday to me. 14. We are going to wild and free tonight because I just turned 21! I am really ready for the best birthday of my life. 15. We are in the fast lane to the best 21st celebration ever. I am going to have a fabulous time tonight. Happy birthday to me. 11. The last 21 years went by so fast. I hope the next 21 are just as incredible as the first. I’m taking my time to enjoy everything. Happy birthday to my dear self. 17. I cannot believe I’m finally 21 years old! I have grown into such a beautiful/ handsome young man/ woman. I hope that I have the best birthday ever. 18. Can’t believe I am turning 21 today… I remember when I was just a little girl sitting on my mum’s laps. I hope I have a wonderful day today. 19. 21 is when responsibility starts to taste better than alcohol. May I enjoy my new taste for responsibility. 20. The countdown to my thirties has started. Nine years to go! 21. I am finally legal. Congrats on my 21st birthday! Happy celebration to me. 22. I remember the excitement I felt when turning 20. But 21 is a great age. Happy birthday to me. 23. I am spending my birthday with friends and family because they will always be there for me when I’m turning 51 Happy birthday to me. Guess what all I’m getting? & most of all I’m getting loved! 25. I’m really enjoying getting older, faster and smarter day by day. I’m extremely happy with where I am today. 21 looks fabulous on me. 26. I had the best birthday ever with my beautiful friends. Thank you all for the thoughtful birthday wishes. It means so much to me. 22. I’m celebrating another most important day of my life. Yes, today is my birthday. 28. I am what I choose to be. And that’s really a great thing to be! If I say so myself, Happy 21st birthday to me. 29. Life is really the best party I have ever been invited to. I hope I have a golden year as I’m surrounded by so much love. Happy birthday to me at 21. 30. It’s my birthday! I thank God for surrounding me with beautiful people. They really made my day even more beautiful. Lucky to have you all. Thank you. 31. Another year older!!! Yaay!!! Thank you, everyone, for your love and support. Most especially, I thank my Maker. 32. I thank my God for another year of life. Wish I succeed in whatever I do. Happy birthday to me. 33. Thank God for great people to spend this milestone with. I love you all so much. Thanks for the wishes. 34. I am truly an inspiration for everyone’s life, all my achievements are the reward of my hard work. My people made me know this, today. Happy 21st birthday to me. 35. May this year be filled with loads of fun, excitement and cheerful memories. Happy birthday to me. 36. May God bless me with a wonderful year ahead and many more glories in life. I’m gonna enjoy my day to the fullest. 37. My passion and dedication towards the success that I want from life are simply great. This is exactly why people always follow my moves. Happy birthday to me at 21. 38. Wish myself the sweetest day of life this birthday. May my 21st year be filled with joy, laughter, happiness, peace, and lots of hope. Happy birthday to me. 39. I wish that I always stay positive in life. Happy birthday to me. 40. On my beautiful day, I wish myself lots of cherishing and beautiful memories to remember. Happy birthday to me. 41. With every increasing candle on my cake, I make a new wish, that God settles me on every side, and that my wishes come true. Happy birthday to me. 42. Wish myself the best day of my life this birthday. May my special day be filled with joy, happiness, peace, and lots of hope, and to continue next year, and decades to come. 43. Wish myself a very happy birthday at 21. May God fill my every day, every minute, every second of life with loads of joy and happiness. 44. Happy birthday to my gorgeous self. I promise myself to have a great day. God bless me, always. 45. Wishing myself a very big happy birthday and all the very best wishes for the day, and much more to come. God bless and be with me always. 46. Happy birthday to me. I wish myself lots of opportunities and success in life. 47. I congratulate myself on the occasion of my special day. I rock at 21. 48. Happy birthday to me. I wish myself lots of great opportunities and success in my road of life. 49. Happy 21st birthday to me. May my joy be large and my bills be small. 50. I’m going to have a lot of fun and unforgettable moments on my day. Happy birthday to me at 21.